12 of 12 has fallen on Easter Sunday this time, so several of these pictures are at my parents' house, with my family. If you've never done 12 of 12, it is the creation of Chad Darnell. Give it a try! 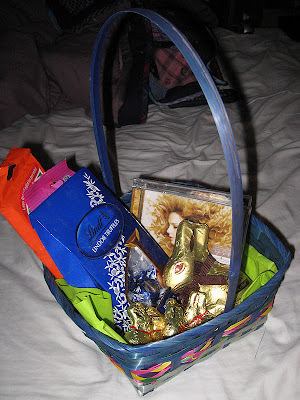 My boy's Easter Basket. I had to wait for him to get to sleep before I could sneak it out to the living room for him to find when he gets up. My latest quilt. 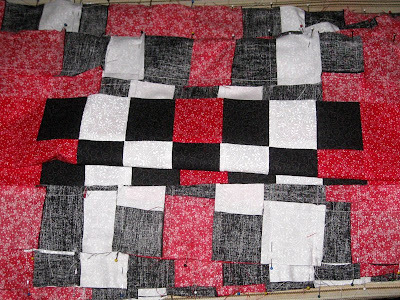 It's still in a bunch of pieces, and I need it to be ready by next Friday, as it's going to be a gift. I need to get this done! 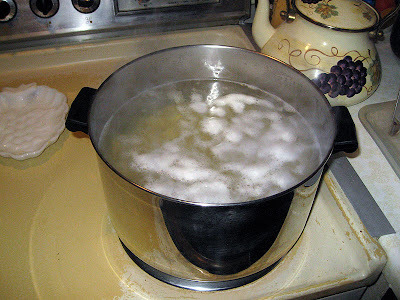 The pot of potatoes I'm boiling for Easter dinner. My cat has been very sick. We thought we were going to lose her last week, but she's home now and getting better. One of her health problems right now is a kidney issue, so I need to give her fluids under her skin twice a day. 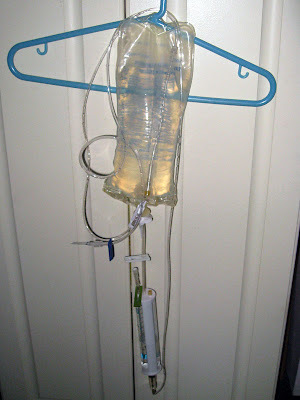 Here's the bag of fluids. 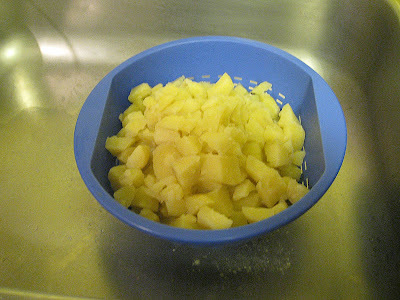 The potatoes, now draining and waiting to be mashed. Time for coffee and dessert! This is my mom's cheesecake. 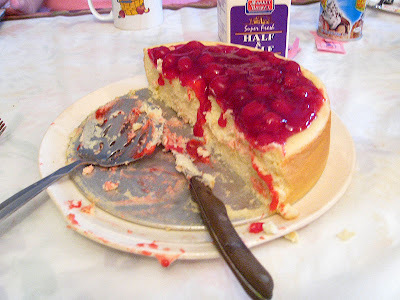 It's not like a New York style cheesecake that I see everywhere else. It's made with riccota cheese, and it is SO delicious! 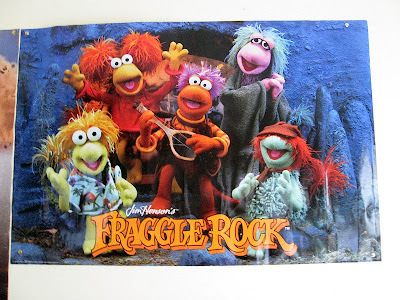 My nephew has a new Fraggle Rock poster. My nephew is a grown man. I love it. My sister's family's dog, Sugar. Ok, this was supposed to be a picture of my younger nephew. 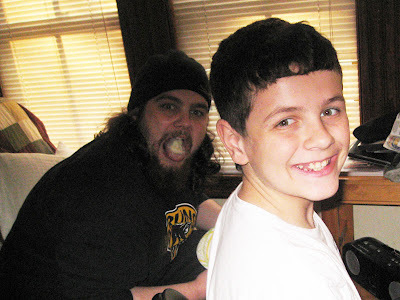 But my older nephew, on the left, decided to pop in for this lovely shot. Charming, huh? I love my family. We all laugh so hard when we all get together. "Come to bed, Mommy. And stop blinding me with that stupid flash." Went to visit kitty today. Over the weekend when we went to visit, we were brought back to where they keep all the patients in their cages. Glea spent both of those visits curled up in the back of the cage. She let us pat her and she purred, but she stayed curled up and mostly had her eyes closed. She looked like she felt like crap. And I was pretty sure she was scared. Today when we visited, they brought her into a room with us. I don't know if it's just because of the quieter environment or because she's feeling better, but he was much more alert, with her eyes open. She stood and moved about a bit, and seemed much more relaxed. And she ATE. The doctor told us that twice earlier today she had gotten her to eat by patting her and basically shoving the food bowl right in front of her face. They brought in some food for us to try to feed her too. We had no luck with their food, but I had brought a can from home, and when I gave that to her, and patted her head, she licked the gravy off for a LONG time, and then she actually ate some, too. And she did it enthusiastically, like she was really hungry. I think it was a combination of the more relaxed environment and of her feeling better. I left them another can for later. Other good news is that her kidney enzymes are DOWN from yesterday. *knock wood* It does seem that the treatments are helping. In fact, we have a tentative plan to take her home tomorrow! *knock wood* In addition to the thyroid medicine I'll need to give her, I will, for the time being, have to give her subcutaneous fluids by needle twice a day. I'm not thrilled about that part, but we need to get our baby home. 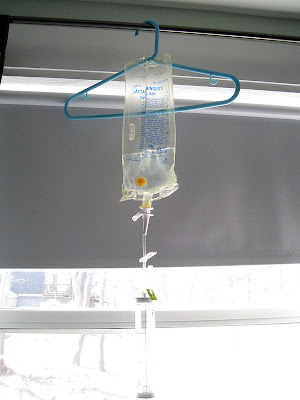 The nurse came in today and showed me how to do it, and they'll show me again tomorrow. 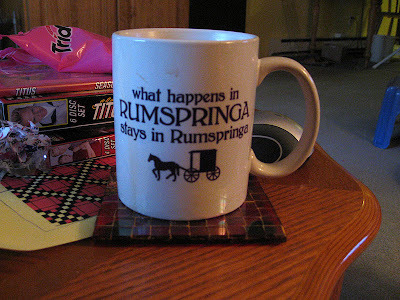 Did I mention I'm not thrilled about that part? 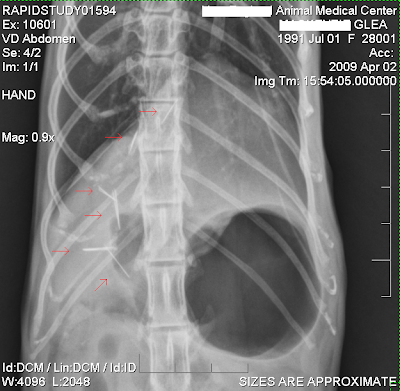 New update on cat: kidney values still rising. This is not good. Fluids and antibiotics, but possible improvement could take a few days, so we just don't know right now if she's going to be ok or not. Going to visit her, then dinner and movie to try to get our minds off of it all. Received a call from one of the vets. Kitty's blood sugar is up and the kidney enzyme is further up. She's not well enough to come home today. 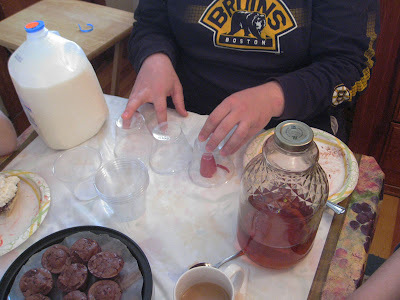 They are going to do a glucose test today to check for diabetes. I am extremely disappointed because I'd really been hoping I could bring her home today. I miss her. I am finding that blogging about this helps me keep record of all this, as well as keeping you all updated. The doctor got to consult with the radiologist. Most of the needles are corroded and have probably been there for a long time and have not been causing problems. One needle is not corroded, and therefore newer and seems to be in the stomach. This may or may not have been causing her symptoms. The good part is that although her vomit had been tinged a little pink, she did not show signs of significant bleeding in the stomach. 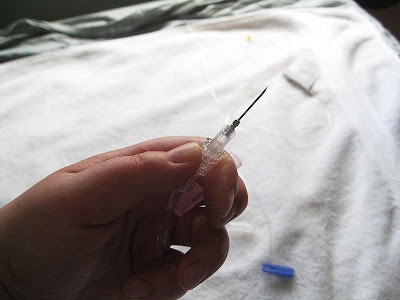 At this point we need to wait and hope that this needle gets resolved by her body the way the other ones did, and can just remain in there harmless like the others. And yes, I have asked for a copy of the xrays. She has eaten a little bit today, she was a little interested in eating, which was a good sign, but did not eat very much. As long as she doesn't vomit, they are going to start the thyroid meds tonight. Those can take a week or more to start working, so unfortunately we won't be able to tell if she's feeling better (and therefore it was just the thyroid making her not feel well) for a week. If all goes well, I can hopefully take her home tomorrow. If she won't eat and either vomits, has diarrhea, or signs of stomach bleeding, I will need to bring her back in. If she is doing well, I need to bring her back in three weeks for a follow up. Thyroid meds sometimes need to be adjusted. As far as the liver cyst and the enlarged adrenal gland, those are just "wait and see" things right now. Maybe they're just a part of her getting to old age and we never would have known about them if not for this episode; maybe it's the beginning of cancer. We don't know, and there's nothing we can do about it either way. So those are the things to not worry so much about right now. So hopefully we will be taking her home tomorrow, and will also hopefully see her getting better soon. Just spoke to the doctor. Kitty definately has hyperthyroidism, which is treatable. The needles did not show up on the ultrasound. The doctor is still going to talk to the radiologist about those. But she said that it's possible those were there for a long time we could maybe just leave them there; it's possible they'd stay fine, or possible they could migrate and cause further problems. New info: there is a cyst on her liver and one of her adrenal glands is enlarged. They do not know if these are early signs of cancer or something more benign. One of her kidney enzymes is elevated; the dr. expected it to be back down today since kitty is now well hydrated, but it's not. The plan for today is to give kitty food, and see if she keeps it down. If that is fine, then they will start giving her meds for the hyperthyroidism. Dr. would like to keep her one more night to keep an eye on that kidney enzyme. So, there is a lot up in the air, we don't know how serious or how benign some of these things are, and we don't have any easy way to find out. But I am more hopeful than yesterday. Yesterday I had picked out her urn. Today I'm hoping we can bring her home, treat her for hyperthyroidism, and keep on keeping on. 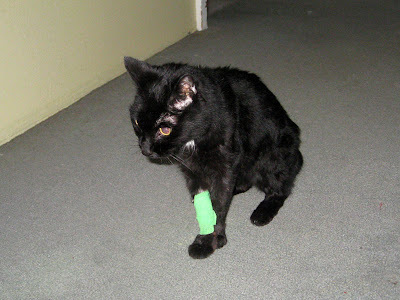 My cat Glea is in hospital tonight. She's had diarrhea and vomiting since last night. I think it might be bloody. I brought her to the vet today, the vet mentioned possible thyroid problem or possible cancer. There was no palpable problem with the thyroid, but she could feel possibly something suspicious at the intestines. So kitty is staying overnight tonight for fluids and anti-nausea meds, and is having bloodwork and xrays. 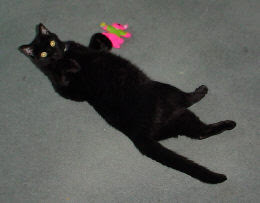 I am expecting a call later today from the vet about the results of the bloodwork. She might possibly be getting an ultrasound tomorrow. I'm not terribly optimistic. 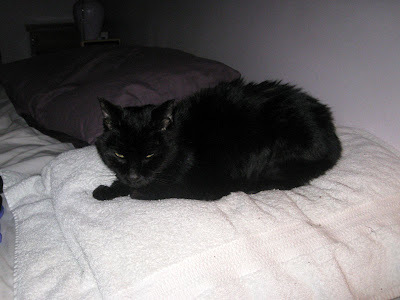 Glea is nearly 18 years old and has been losing weight for a little while, now. I have a feeling that this is going to be exactly like what happened to the last two cats: I am going to pay a couple thousand dollars for them to tell me we need to put my cat to sleep. 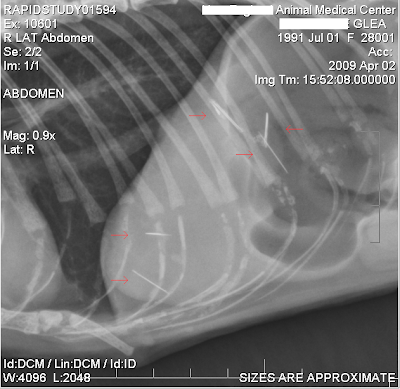 EDIT: Doctor called me back...the xray shows what appears to be SIX NEEDLES in her liver. They can't tell for sure yet, all they can see is that there are six very straight things near or in her liver that appear the way metal appears on xrays. The fact that I sew alot and that this cat has pica would definitely support the theory that the cat ate six needles. 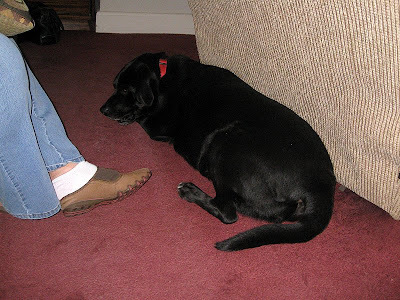 Her liver enzymes are moderately elevated and her blood sugar's a little high. Thyroid test not back yet. She is stable so the plan for tonight doesn't change, just fluids and anti-nausea meds. Doctor is going to consult with surgeon and radiologist to see if these can be successfully surgically removed. She would have an ultrasound tomorrow morning to help decide this, and also to see if there are any more complications (cancer).